Gator is a brightly-painted wooden alligator, posed with a smile on the children’s carousel. “He loved the flashing lights,” writes Randy Cecil in Gator, along with “the sound of the calliope, and the feeling of wind on his face.” Unfortunately, the crowds grow smaller at the amusement park, and eventually the rides stop running, and the lights go dark. “The laughter was gone,” writes Cecil, and the book takes a dramatic turn. One day the wooden alligator “touched the hole in his heart where the pole had been, and looked over the empty park…where he had spent his entire life. Randy Cecil also drew the book’s soft oil illustrations, and they give the book a strange grandeur. There’s a few quirky drawing of skinny children with big heads, but the rest of the book is about the carousel alligator, and how he ends up meeting some real animals at a zoo. They seem just as unreal, thanks to Cecil’s eccentric sketches. The text takes some dramatic turns, but Cecil keeps it light with some funny drawings. 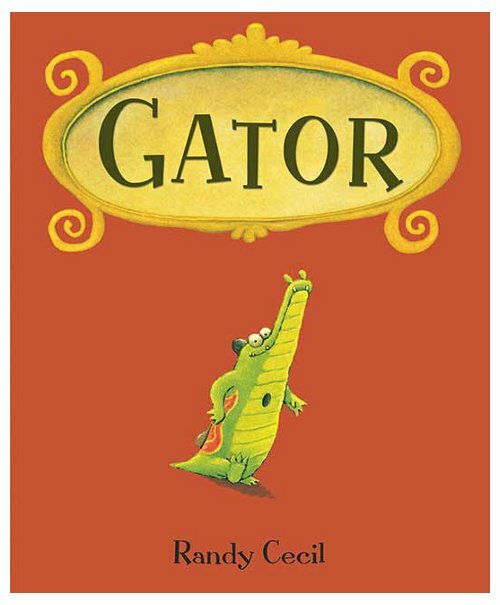 Before he can get to the zoo, the alligator has to wander through a hazy brown forest, and “A cold wind blew through the hole in Gator’s heart.” His best friend on the carousel was a giant wooden duck, so he’s surprised when he crosses an arching stone bridge, and sees real ducks swimming in the stream. He’s attracted to the zoo by the sound of the children laughing, and thinks it must be some kind of amusement park. “But where were the flashing lights?” Gator wonders. Then he wanders into a pen that’s filled with real alligators, which Cecil describes as “big” and “scary.” He tiptoes away, then sits alone on a park bench, and covers his eyes as he cries. Soon he’s recognized by a child’s father, who remembered riding the carousel as a kid. Soon his son wants to ride the carousel, too, and so do more and more of the children at the zoo.